Small ultrasound is expanding the utility of this versatile modality. The use of small ultrasound units is rapidly growing, primarily due to low barriers to market entry. The regulatory pathway for medical ultrasound is clearly defined in most of the world, and advances in consumer electronics have made ultrasound systems inexpensive to design and manufacture. GE's release of its compact Vscan system almost a decade ago sparked a proliferation of handheld ultrasound systems, and while many such systems continue to become smaller, less expensive, and capable of higher image quality, the majority remain similar to traditional cart-based systems—simply with lower image quality and smaller screens. "We're starting to see improvements in technology such as new wireless protocols and bandwidth, cloud computing, miniaturization of components, advanced imaging quality, and updated battery technology, which are enabling ultrasound systems to become highly portable and less infrastructure dependent," says Shawn St. Pierre, Hologic's senior director of ultrasound solutions. Moreover, there's been a great focus on portability, eliminating wires, improving durability, and simplifying setup and cleanup, as well as incorporating cloud-based technology to allow for immediate sharing and access to information. "With small ultrasound devices, examinations can be done closer to the patients and with earlier exams and faster diagnosis, which will decrease costs," says Ann-Sofi Hoff, marketing and product manager at ContextVision. "The use of ultrasound for guidance can lead to significant cost savings in several ways, including reduction of procedure-related complications, shorter procedure times, reduced length of hospital stays, and increased use of minimally invasive procedures in less expensive outpatient settings." Many of the traditional ultrasound companies already have or plan to include a handheld ultrasound device in their portfolio, either created in-house or through an original equipment manufacturer partnership. This market trend also offers a chance for many startups to innovate in this underserved market, and there's been more collaboration between companies to develop products to meet the evolving needs of radiologists. Hoff notes that ContextVision has invested significantly in AI during the last few years and is now combining those features with its ultrasound imaging experience to meet demands that haven't been possible to address before. "To meet the need for high image quality on the handheld ultrasound devices, we have developed and released an image enhancement product dedicated for this market—VolarView—which uses ContextVision's … intelligent image enhancement and is designed for efficient implementation on all types of handheld devices such as smartphone- and tablet-based systems," she says. Rivanna Medical's Accuro is a handheld ultrasound device but is application specific and does not compete with other general-purpose handheld products. Will Mauldin, PhD, CEO of the company, says the utility of ultrasound is significantly limited due to the modality's operator dependence, and Accuro was developed to overcome this limitation for spinal anesthesia applications. "Accuro is the ﬁrst ultrasound-guidance system designed to optimize needle placement to enhance spinal and epidural anesthesia accuracy," Mauldin says. "It augments a high-quality ultrasound image with automated real-time detection of spinal landmarks, along with a 3D navigation view. The product was designed to reduce the learning curve associated with neuraxial ultrasound, thus making it more accessible to anesthesiologists who, as a specialty, are not traditional ultrasound users." Mauldin notes that the application-specific trend is growing towards ultrasound products that reduce the modality's learning curve. "These new products automate the image acquisition and/or interpretation process for rapid access to clinically actionable information, streamlining hospital workflows," he says. "AI may [also] increasingly become a part of this trend because it is especially well suited to automating image classification and feature-detection tasks." Another new entry is Hologic's recently introduced Viera portable breast ultrasound system. 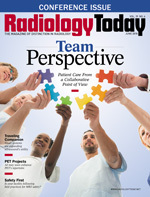 It was expected to become available for purchase as this edition of Radiology Today went to press. "The new system delivers accurate, high-resolution diagnostic images at the point of care, enabling optimization of clinical workflow and patient pathway and making it ideal for quick diagnostic looks, visual confirmations, and interventional procedures," St. Pierre says. "It's designed to provide image quality that matches that of traditional midtier ultrasound carts, but at a much lower cost, allowing facilities to free up their ultrasound equipment during simple procedures such as biopsies." Canon Medical Systems USA's premium Aplio i800 ultrasound system also recently received FDA clearance. Dan Skyba, director of the company's ultrasound business unit, notes that this small mobile unit includes an ultrahigh frequency—24 MHz—transducer and a new 22 MHz hockey stick to visualize small and narrow areas such as fingers and joints or for interoperative procedures. "Our goal is to expand the clinical utility of ultrasound while improving performance and workflow by offering providers diagnostic capabilities that are cost-effective, less invasive, and safe," Skyba says. "We designed the Aplio i-series to meet the needs of health care providers today and offer the flexibility to upgrade as their needs change in the future, with a truly scalable platform." In an attempt to extend ultrasound's reach, Butterfly Network Inc has developed a novel augmented reality telemedicine technology on Butterfly iQ, the world's first whole-body ultrasound imager, which radiologists can use to remotely acquire any ultrasound scan, bringing medical expertise to wherever it's needed most. "This is an important step in fulfilling the promise of bringing ultrasound to the millions that do not have access to this essential medical technology," says Jonathan M. Rothberg, PhD, the company's founder and CEO. "Two-thirds of the world has no access to medical imaging, and, even in the developed world, expense and lack of expertise limit its accessibility." Handheld units are becoming more popular among clinicians as the integration of advanced features enhances the utility of these systems. With the introduction of portable handheld units, due to the development of miniaturized devices with advanced computational power, the ability to quickly image internal organs and external small parts has been enhanced, particularly at the bedside point of care in hospitals and medical offices. "With these units, there is no need to worry about cables or moving bulky machines around the patient," says Mordecai Koenigsberg, MD, director of ultrasonography at Montefiore Health System in Bronx, New York. "A primary care physician can use ultrasound as a seamless part of his or her practice to make diagnoses more quickly and accurately." He notes that more small units are being introduced, including a compact unit that can fit into a doctor's pocket and another that can display images on a cellphone. "A physician could share the ultrasound pictures with the patients, pointing out their internal organs, and show them what helped him or her understand their disease process," Koenigsberg says. "Granted, a short bedside ultrasound will not provide the same information as a full-scale ultrasound examination performed by an experienced technologist but, for some questions, a brief, focused exam may be enough." Koenigsberg warns that it does take some time for an inexperienced physician to learn to accurately interpret the images produced by these small units, which is why many practitioners take courses, learn online, and review cases with experts. "The current trend is to start using these small units early in a physician's training," he says. "In many medical schools, students are already learning to use these handheld units at the bedside as part of their training. The students view these units as modern-day stethoscopes." David T. Fetzer, MD, medical director of ultrasound in the department of radiology at the University of Texas Southwestern in Dallas, says the combination of recent technical innovations and the driving need to provide enhanced point-of-care services has fostered an expansion of small, low-cost, portable ultrasound devices, and these devices can be implemented in environments where imaging may not have been previously available, both within and outside the hospital. "There is an ever-expanding list of uses that include emergency department trauma imaging, intensive care cardiac imaging, and bedside procedural guidance," Fetzer says. "The low cost also allows these devices to be implemented in small outpatient practices and rural areas around the world. The ability to perform both deep and superficial imaging, to connect these devices to other portable electronic devices—eg, laptops, tablets, or even cell phones—and stream images to consultants anywhere in the world further enhances these devices' utility." Fetzer notes that these small ultrasound devices have the potential to enhance a provider's assessment of a patient, augmenting the current physician exam. For example, assessment of cardiac motion and pleural spaces can be combined with heart and lung auscultation, respectively. "A trauma victim evaluation can be enhanced by a quick evaluation for free fluid and pneumothorax," Fetzer says. "These and many other examples allow for 'on-time' diagnosis, which may expedite care and improve specificity of one's differential diagnosis." Still, he notes, challenges and drawbacks should also be considered. Portability and decreased cost are achieved by making certain sacrifices to functionality. "Small ultrasound systems may not provide certain high-level functionality such as spectral Doppler, shear wave elastography, or contrast-enhanced ultrasound," Fetzer says. "In addition, the output power from these portable systems may not be sufficient to image every patient, particularly with the worsening obesity epidemic." Above all, if findings seen by a portable ultrasound device are inconclusive or suspicious, consideration needs to be given to a complete ultrasound examination with a premium system that may have the power and functionality to provide additional clarity and certainty. Michael A. Smith, MD, director of ultrasound at MedStar Washington Hospital Center in Washington, D.C., says images can now be obtained, with the same probe, of superficial structures such as the thyroid, while also providing the penetration to image organs deep in the body, such as the kidney and liver. These images can then be displayed on an iPhone or tablet. "Point-of-care ultrasound is advancing. Companies are targeting medical students, and I believe ultrasound will become part of a standard physical exam, much like a stethoscope," Smith says. "Clinicians will be able to get additional information much quicker. Newer units also are much cheaper than standard ultrasound machines. Entry prices can be as low as $2,000, making these machines available to any and all practices." There are many questions that need to be answered, however. What standards should be set for training? How will reimbursement be handled? Who is responsible for final interpretations? Will handheld units be for physicians, medical students, or physician assistants, or will patients be able to purchase units? What would be the clinical ramifications if nonmedical people decided to do their own scanning? Mauldin says that, in diagnostic applications, patients benefit more from the already widely available cart-based ultrasound systems that possess superior image quality and are used by skilled operators and image interpreters. "In other applications, such as needle guidance in orthopedics, anesthesia, and the emergency department, the laptop-based 'portable ultrasound' systems made by SonoSite and others have largely saturated the market. These systems achieve a sweet spot with excellent image quality and sufficient portability for hospital use," Mauldin says. "Therefore, handheld general-purpose ultrasound has struggled to make much of an impact in areas where ultrasound is already in place. Instead, it has been relegated to the margins." Still, some unique applications may exist where portability is of primary importance. Ultrasound, as a modality, allows for real-time imaging and immediate diagnosis and, thanks to handheld devices, these advantages can now be deployed at the point of care, wherever that may be—bedside, rural environments, emergency settings, etc. "In breast health, [for example], physicians can provide immediate answers at the point of care without needing to wait for equipment or rooms to become available," St. Pierre says. "This helps with efficiency and patient satisfaction as it reduces the wait time for patients and, as a result, the associated anxiety." St. Pierre expects to see significant growth in handheld ultrasound driven by continuous improvements in size, weight, and image quality, as these features enable use across more clinical applications and reduce dependency on departmental boundaries. "We also expect that the portability of the device will increase access to ultrasound beyond radiologists," he says. "This growth will fuel the need for more training and decision support tools, as physician experience delineating normal vs abnormal sonographic findings is paramount to achieving accurate exam results and interventions." Hoff believes the future will bring more advanced and "smarter" small ultrasound systems with a focus on ease of use. "We will see tools for automation in all aspects, from image acquisition and guiding procedures to diagnosis and treatment follow-up," she says. "The focus will not be on making the systems smaller but rather smarter, a similar development as seen in the mobile telephone industry. AI will be a natural part of these solutions. Still, the highest priority will be on image quality to facilitate accurate exams."